Balloons are a nice way of transportation to move from A to B in peace and serenity. 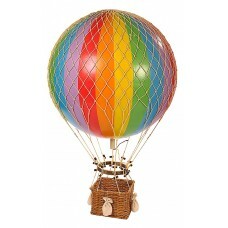 A hot air balloon is an aircraft that uses the static buoyancy of hot air inside it and is an ideal means of transport. Here are beautiful replicas of such antique models. They are ideal gifts for lovers of this type of hobby and sport. Vintage Hot Air Balloon♥ Iconic and inspiring helium filled balloons were one of aviation's fi..